Tiger Bloom is a low salt, highly concentrated, powerful, nutrient fortified fertilizer for those who want the most from their plants. It is a phosphorus fertilizer designed to encourage multiple bud / blossom development. Formulated with a low pH for stability and to keep micronutrients available. This can be used on hydroponic, container plants and outdoor soil applications. Phosphorus: is a nutrient necessary for soil and plant health and needed for flower and fruit growth, inlcuding multiple bud development. It is also needed for good root development. Nitrogen: It also includes 2% by weight of Nitrogen. Nitrogen is necessary for photosynthesis and Chlorophyll development. Chlorophyll is what gives plants their green color and is a primary componet by which plants convert sunlight into sugars through photosynthesis. This is just enough to give it a small boost. Potassium: The potassium (4% by weight) in Tiger Bloom is necessary for plant health and strength in difficult times. It helps to regulate stress from heat or other stress related factors. Tiger Bloom also contains trace nutrients that are needed for plant health and internal functions. On fruit trees and blooming plants, multiple blossoms can equal more fruit. You don't want just more blossoms and fruit, you want better fruit. TIger Bloom can help acheive that. It is formulated to be used throughout the growing season from bloom to harvest. For best results, use Tiger Bloom at the first sign of flowering and continue through harvest. Experimenting with your plants may be need to find the exact amount per gallon. It is highly concentrated so a little goes a long way. 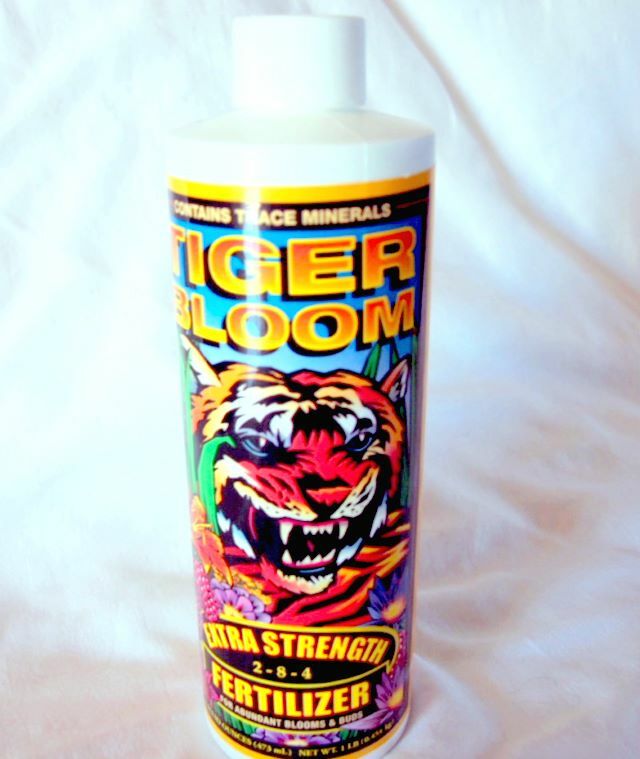 Tiger Bloom is concentrated and designed to be mixed with water. All mixtures are in teaspoon per gallon of water. For daily use on indoor or container plants, 1/4 - 1/2 teaspoon per gallon of water and can be used as a foliar spray. Spray both sides of leaves. For outdoor soil applications, 2 - 3 teaspoon per gallon of water. Use twice a week.